Dionte Stephens prepares to shoot a basket as Brookswood’s Brandon Ahrens attempts to block him during the season-opening game on Saturday night at Charles Hays Secondary School. 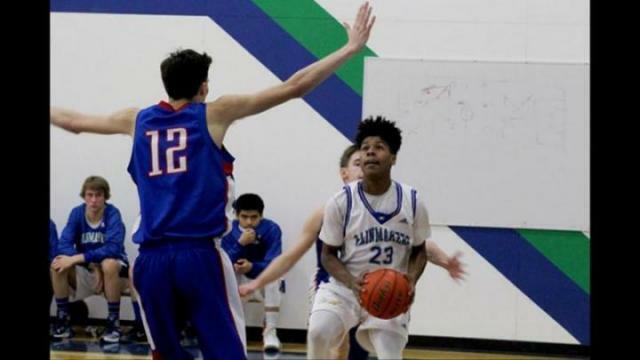 The Charles Hays Secondary School senior boys basketball team swept the Brookswood Bobcats in the season opening-weekend. It was nothing but net last weekend at Charles Hays Secondary School (CHSS) as the senior boys basketball team kicked off its season in style by sweeping the Brookswood Bobcats. The Rainmakers beat the team from Langley in two very different games, the first an offensive statement and the second, a defensive battle. On Saturday evening, the boys won 85-48 in front of a packed gymnasium. The teams played again on Sunday afternoon, with CHSS edging the Bobcats in a tense nailbiter 55-54. “It’s nice to have that. We got two wins, which is very good to start the year like that,” said coach Mel Bishop. Charles Hays, in partnership with Caledonia Secondary School in Terrace, flew the Brookswood team up to get their boys some good competition. The story of the games were different for Bishop too. He thought the boys shot the ball well in the first game, but wasn’t particularly happy with their shooting in the second. “We kind of picked it up towards the end in both games, just playing our own brand of basketball. Today wasn’t the greatest win, but we still pulled it out as a team,” said Quinn Leighton, who scored six points in the first game and eight in the second. The season opened with a three-point basket by Skyler Wesley, who also ended the first quarter with a three. The game was tied at 15-15 at that point, but the Rainmakers quickly changed that by going on a 12-0 run to start the second quarter as the Bobcats struggled to finish plays. Kolby Jones was instrumental throughout the two games, scoring some key three-pointers. His baskets would be the difference in the second game. The Rainmakers continued to dominate in the second half of Game 1, highlighted by a 21-11 third quarter. The fourth quarter saw some good blocks by the Rupert squad and a couple of nice dunks by Liam McChesney, which pleased the enthusiastic crowd. Wesley scored 16 points in the game to lead the team. Ben Rabel added 12 points and McChesney had 11. The Bobcats came out more energetic in Sunday’s game, which wasn’t as well attended, likely due to the road conditions. Brookswood led the game 18-14 after one quarter. The Rainmakers were struggling to pressure the opposing team on defence early on. The problem continued into the second quarter, as the Langley team was consistently getting their own rebounds and driving to the net without much opposition. CHSS was also having trouble sinking baskets, especially around the perimeter, which was so different from the first game. Despite that, they were keeping pace and trailed by just one point at the half. Both teams had tightened up defensively. In the second half, things got a bit rough between the two teams, with some confrontations and light shoving going on. Adding to that, coaches on both sides were fired up about what they felt were missed calls. “Sometimes you just go to calm down and just play. If someone else is in your head, you’re not thinking about the game, you’re thinking about that guy,” said Leighton. The final quarter was intense and in the final few minutes, the crowd seemed to be collectively holding its breath. That’s when Jones really stepped up, sinking two huge three-pointers in a 40-second span to give the Rainmakers a 51-46 lead with 3:20 to play. With the home team leading by two points and just 35 seconds left, Jones was fouled, giving Rupert the break it needed. He scored two of his three free throws — and eight of the Rainmakers last 10 points — which would turn out to be deciding factor and the team held off the Bobcats 55-54 for the sweep. Malcolm Brown netted 13 points in the low-scoring affair and McChesney had 10 more. Bishop was happy with the two wins, but there’s still more work to be done. “We have to get better defensively and I still don’t think we rebounded our offensive board like we have to,” he said. The boys play a game in Kitsilano tonight and then take part in the North Shore Tournament in Vancouver this weekend.